a tribute to the architect, designer, artist . 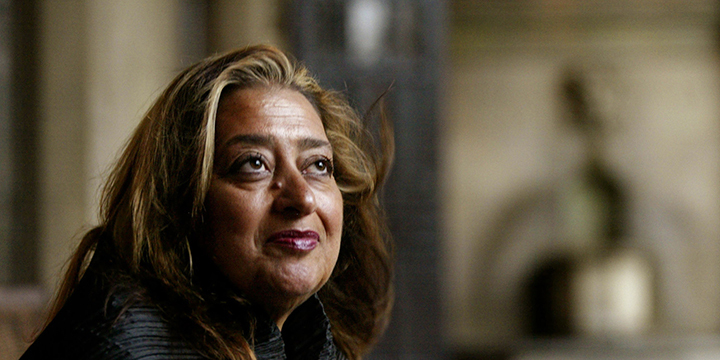 . .
Our featured artist this month is the infamous Iraqi-British architect, artist and designer, Zaha Hadid, who unfortunately passed suddenly in March, 2016, at the age of 66. Her architectural creations are distinctively neofuturistic, characterized by the powerful, curving forms of her elongated structures with multiple perspective points and fragmented geometry. The appeal in her work lies in the sense that they embody a unique female personality; her work will always be seen as voluptuously feminine. In describing herself, she has remarked that she has always felt "powerful," even as a child. During her early artistic development, she deeply admired the Russian Supremist paintings, especially those produced by Kasimir Malevich. 1989 painting by Ms. Hadid of Hafenstrasse, a street in Hamburg, Germany. 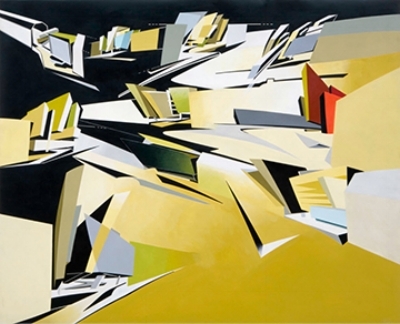 In later years, she relied more and more on the computing capabilities of the computer to create her complex and fluid compositions – originating the new idea of "parametricism;" the designing of spaces to geometrics, using a self-referential system, in which all the elements are interrelated, and if any changes occur from the outside, that alters all the other parts. One can actually say that this parallels Wassily Kandinsky's idea of "inner necessity," where there is an inherent wholeness that relies on all of its parts . . . the parts "call" to the necessity of the part next to it. Even though she was not the first to explore the floating curve in the language of architecture (see the work of Eero Saarinen and Oscar Niemeyer), Zaha Hadid continued her explorations and can now be said to be identified by her uncompromising, demanding vision and has shaped the way we see them: seductive, voluptuous and speaking of an incomparable ease. ("fascinated by abstraction . . liberated me from all of these rules."